A new piece of wearable tech is looking to use your hand to replace your keyboard on your smartwatch, virtual reality headset and more smart devices. Tap, which is essentially a fabric version of brass knuckles with rings on each finger, is a Bluetooth device that allows you to use any surface - from tables and walls to your thighs and even your head - to type out messages. 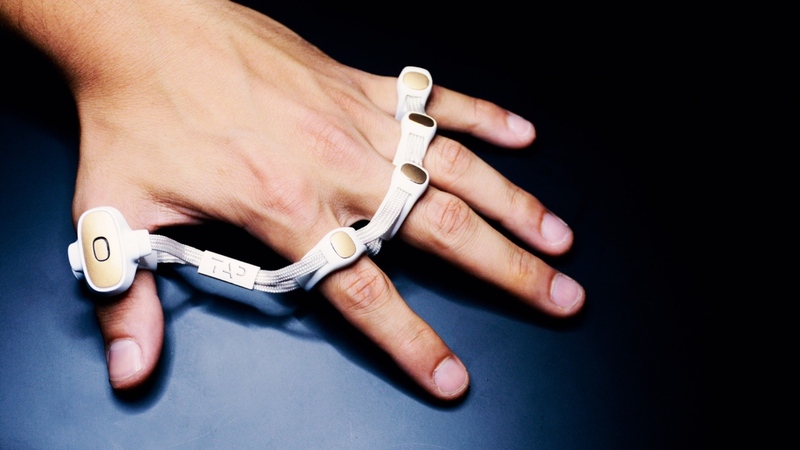 The wearable sees you put your fingers through each strap, with the thumb loop giving you haptic feedback and a sensor, which turns into a mouse. In use, each of your fingers takes the place of the vowels, with different gestures and combinations giving you the rest of the alphabet. Naturally, the device's best use will be for smartwatches, such as replying to messages on the Apple Watch, but the fact it also works within virtual and augmented reality, where vision is more limited, is also interesting. Since it works over Bluetooth, Tap can be used to type on the likes of PCs and tablets, too. With the battery life stretching to around six hours, you can get through most of your office shift by just tapping on your desk. If you are running low, a charging case will also be on hand to top things up and keep it safe when not in use. Of course, after years of conditioning with the QWERTY keyboard, trying to get used to the idea of replying to emails, texts and everything else would take time to get used to. However, if it works as it says, it could prove to be one of the best examples of expanding from your small screen or interacting in a different reality. And if the whole concept feels slightly familiar, that's because Tap initially made waves earlier this year. Since then, though, it appears to have refined its design and dropped the 'Tap Strap' moniker. Those interested in branching out can pre-order the Tap now for $129.99.